LA Unified is opening its first all-boys school next week, but so far only half the number of hoped-for students have enrolled. The Boys Academic Leadership Academy is starting with sixth- and seventh-grades, offering 100 spots for each grade. Eventually, the South LA school is approved to go through high school, opening a new grade each year, for a capacity of 700 young men. But as of Thursday, the academy had signed up only 100 boys. The last orientation before school begins was Thursday evening at the school, to encourage last-minute sign-ups. The slow enrollment is a disappointment, but not unexpected. Enrollment has increased steadily; it’s now triple what it was three weeks ago. Five to 10 students come in every day. Last year, two new girls’ schools in Los Angeles had the same trickle-in enrollment challenges. The district opened its first all-girls school, the Girls Academic Leadership Academy at Los Angeles High in the Mid-Wilshire area, and an all-girls public charter school, the Girls Athletic Leadership School, simultaneously opened its doors in Panorama City. Moorer said the new school is modeled after the Eagle Academies in New York, single-gender public schools in crime-ridden neighborhoods. Like at those schools, students at the Boys Academy dress in uniforms with ties. Moorer said his students will learn to compete with each other and are divided into “houses” named after minority heroes: boxer Muhammad Ali, writer James Baldwin, astrophysicist Neil deGrasse Tyson, and revolutionary Che Guevara. Moorer said he wasn’t aware of how the house team structure sounded similar to Hogwarts in the “Harry Potter” novels, which has houses with names like Gryffindor and Slytherin. “I’ve not read the Harry Potter books,” he said. Over the summer, Moorer and some of the new students met for a few weeks to get them prepared for the new school. They did trust exercises like leading each other blindfolded through the school and tying themselves in a human knot and then unraveling themselves. Moorer said he has gone out to the community in the area where the school is being co-located at Washington Preparatory High School in the Westmont section of Los Angeles. The school is located in an area frequented by gangs, and it’s on the campus of the school where board member George McKenna taught and served as principal, and whose success was made into a movie starring Denzel Washington. McKenna is disappointed in the boys’ school enrollment numbers so far too. The Boys Academy plans to have the traditional high school sports like basketball and football, but also golf, tennis, and lacrosse. There will be regular yoga breaks and opportunities to study tai chi and other martial arts to learn focus and relaxation. The board last year approved nearly $700,000 to upgrade classrooms for the Boys Academy, reflecting a trend of public schools experimenting with same-gender classrooms. The Young Oak Kim Academy in Los Angeles has separate boys-only and girls-only classes in middle school, but this is the first all-boys school. 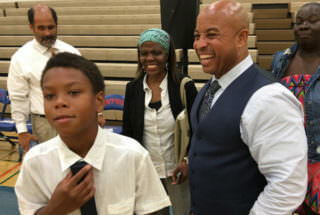 Moorer, who came from View Park Continuation School, about eight miles away from his new school, said he will be coordinating with nearby Los Angeles Southwest College so his students can earn Associate Arts degrees while they are in high school. On the first day of school next Tuesday, the entire school will visit USC to tour the campus. “On their first day here, I want to show them where they can eventually end up,” Moorer said. The school is not a military academy, nor is it a place for problem youth, but Moorer said people’s misperceptions are contributing to the enrollment challenges. Although most of those signed up so far are African-American, boys from all ethnicities have shown interest, he said. The school is open to all boys in the LA Unified school district. Every day at the Boys Academy will start off with a town hall as Moorer presents a positive message for the day and students all give thanks for something. He then will read the late-1800s poem “Invictus” by William Ernest Henley, about resilience and how the students are the master of their fate and captain of their souls, Moorer said. The school is also providing mentoring with role models from community groups such as Phi Beta Sigma who will work one-on-one with the students. *This article has been updated to correct that the principal’s former school, View Park Continuation School, is not five blocks away and is not an independent charter school.